Concrete core drilling is a process that requires the proper tools, technique, and skills. Concrete core drilling is a process that requires proper tools, technique, and skills. 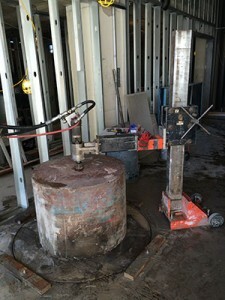 Before getting started, the contractor should have a concrete core strength test in place that will determine what the proper process and tools will be needed to get the job done successfully and safely. While some concrete contractors opt to do the drilling themselves, others will call on drilling specialists for that part of the job. Here are three pointers all professionals should follow for concrete core drilling. Concrete contractors will either buy or rent a drill for concrete core drilling. For holes up to three inches in diameter, professionals will typically use a hand-held drill. For contractors that choose to purchase a drill, the most prudent thing to do is to purchase one that comes with a level of flexibility that will allow for its use in other projects. Some of these other applications may include drilling dowel holes, plumbing holes, or holes used for electrical purposes. When choosing the right drill, keep in mind that the minimum core size for testing is 3.7 inches in diameter; this means that you should use a drill stand or rig-mounted unit. The hand-held, rig-mounted, and intermediary units all come in various sizes and can be used hand-held or with a drill stand. For concrete core drills, you will find hydraulic, air, and electric power options for the motors. The type that you’ll choose will depend on the power availability at your job site as well as the environment and weather restrictions. There are also units available that feature options for drill speed for the specific hole size and hardness of the concrete. When choosing the diamond bit for the drill, you’ll have to consider the pounds per square inch of the concrete and the aggregate hardness. The diamond drill bit will correspond to those considerations in the following ways: A softer diamond bond is appropriate for harder materials while a harder diamond bond is more appropriate for softer concrete. G&M Services also offers services in the way of concrete drilling and sawing, concrete scanning and FireStop. To get started with us, call today at 410-787-8828 or visit our contact page. Follow the official company page today on Google+, Facebook, Twitter and LinkedIn. This entry was posted on Thursday, June 14th, 2018	at 11:03 am	. Both comments and pings are currently closed.